For 10 & Under - $5.49 meals includes a single serving of applesauce, drink and a treat! 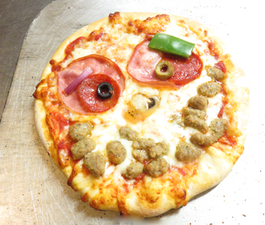 8-inch pizza that’s sure to make you smile! 8-inch pizza with child’s choice of 1 topping. A child’s favorite! Served with potato chips. Make any day feel like the State Fair! Served with potato chips. Thin noodles topped with spaghetti sauce, served with a piece of garlic bread. *Kids menu is for dine-in customers only. *Sign up for the birthday club and get a FREE pizza on your next birthday!